Our full-day camp runs from July 2nd through August 23th. Your child can select their favourite themes or attend for the entire summer with new activities each week. This week, campers will explore the world of food! Children will taste, cook, and create yummy healthy creations. Your little camper will learn about nutrition, the various food groups, and how to keep their bodies healthy. We will end the week with a special visit from a Cordon Bleu Chef. Keep your child’s mind active this summer! Your little Einstein will enjoy making their own fossils, become a dirt expert, make rainbow stew, create their own ocean, make radioactive-looking slime and experiment with balloon science! Your child will explore the world of science through experiments, nature walks, crafts, and more. Bring your sunscreen and hat! This week, children will participate in picnics, water balloon fun, making beach art, learning about life under the sea, treasure hunts, and much more! Bathing Suits, towels, sunscreen and hats are mandatory. This week, your little camper will explore, create and investigate the world of bugs! Campers will learn about a variety of bugs including ladybugs, mosquitos, dragonflies, ants, centipedes and many more! Each day will be filled with fun facts, stories, crafts, activities and stimulating the imagination! This week, your little camper will travel around the world! Each day, children will visit an exciting new place. Some examples of our travels include Hawaii, Costa Rica, South Africa, and Europe! Children will take part in various arts and crafts, cooking, stories, and outdoor activities with each new place they visit. Come join our jungle adventure! Campers will embark on a week-long adventure in the jungle with catch the monkey tag, face painting, creating their own binoculars, while learning fun and fascinating facts about jungle animals. Join us on a Disney adventure! Your little one will enjoy making crafts based on their favorite Disney movies, singing Disney songs, participating in Disney-themed lunches, and much more! Come join us for some intergalactic fun! 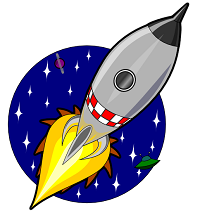 Campers will go on a week-long space adventure that includes Cosmo Dodgeball, making water rockets, a moon rock treasure hunt, building spaceships, flying saucers and much more!